I’m thrilled to introduce Hashivenu, a new podcast that highlights resilience practices embedded in Jewish teaching and Jewish living. How has the Jewish people survived for millennia? It’s an age-old question, asked by Jews and non-Jews alike, from Pascal to Goethe, Tolstoy to Twain. One answer is that a capacity for resilience has been woven into the fabric of Judaism over thousands of years. Judaism’s focus, both spiritual and practical, on helping people get on with living in the face of challenges, pain, and tragedy has helped the Jewish people to survive. More to the point, this orientation toward resilience can serve us extremely well today in the current political environment—if we take advantage of it. I’ve been thinking a lot about resilience in recent months, as the American political system has become unglued and many of the hard-won social gains of the last fifty years suddenly seem imperiled. Even as I spend a lot of time thinking about how Judaism can and should change, these last months have made me focus more intensively on what Jewish traditions can teach about how to live wholly and purposefully in the face of profound disappointment. To explore this question, I felt compelled to revisit aspects of our tradition, consult rabbinic colleagues, and share what I learned. How to best go about this? When I thought about it, and the ways people communicate today and share stories, the answer seemed self-evident: I’d launch a podcast! I love the medium; it is at once intimate and far-reaching. I’m thrilled to introduce Hashivenu, a new podcast that highlights resilience practices embedded in Jewish teaching and Jewish living. To better understand the terrain I’m exploring in Hashivenu, let me take a step back and frame the Jewish idea of resilience. The American Psychological Association defines resilience as “the process of adapting well in the face of adversity, trauma, tragedy, threats and even significant sources of stress.” Harvard University psychologist George Vaillant suggests that resilience can be understood as a “twig with a fresh, green living core” that springs back and continues to grow after encountering pressure. Judaism, writ large, is about resilience. Across the span of Jewish history, Jews have experienced extensive trauma, even catastrophe, and we have survived—as a people and as a civilization. After each catastrophe, the prevailing paradigm was inoperable: we no longer knew how to understand ourselves in relation to God, to other Jews, and to other peoples. And, throughout our history, Jews have ultimately transcended catastrophe after catastrophe. We have repeatedly breathed new life into the Jewish people and the Jewish civilization and we have found pathways toward repair. From trauma, we have had to heal. We have had to recover and re-vision, regenerate and re-seed vital Jewish life. We have found ways to cultivate resilience, both individually and collectively. Jewish history is, in many ways, a recurring cycle of crisis and renewal. The Second Temple in Jerusalem , the center of religious life, was destroyed in 70 CE, and our ancient sages created rabbinic Judaism, organized around synagogues and home observance through the prism of halakhah (Jewish law), was created. After Sephardi Jews were persecuted and expelled during the Inquisition, Jewish mystics responded by building up Kabbalah , a deep and complex tradition. In Eastern Europe, Hasidic Judaism emerged in the aftermath of the terrible Chelmnitsky massacres. Jewish emancipation, made possible because of Europe’s Age of Enlightenment, brought many opportunities and also much confusion about identity and community. This ferment sparked tremendous cultural creativity, itself a vibrant expression of resilience—witness Spinoza’s philosophy, Marx’s political theory, Freud’s psychiatry, Durkheim’s sociology, Einstein’s physics, Schoenberg’s compositions, and the list goes on. Emancipation—its opportunities, limitations, and crises—also gave rise to Zionism, the Jewish nationalist movement, which ultimately created an independent Jewish state after nearly 2,000 years without one. Even as these developments are more complex than this summary suggests, they are also only a handful of examples of collective Jewish revival after trauma. In Judaism, separating the collective from the individual is always difficult, since the two are so often interdependent. This much is clear: Judaism has sustained the Jewish people because it sustains individuals. How many parents have buried children yet continued to work to build a better world? How many sons and daughters have seen their parents, their entire communities, consumed by conflagration and persecution, and yet found the strength to rebuild? How many have seen their lives destroyed and found the will to start all over again? Our cultural capacity for renewal is built on a foundation of individual practices that encourage and even command it. “Every day creation is renewed,” the Jewish morning liturgy teaches. If we open ourselves to this teaching, we can see that every day, we have an opportunity to recommit ourselves to living out our values. The Talmud teaches that we should say 100 blessings a day. We could see this mandate as legalistic and oppressive, or we could see it as an invitation to engage in ongoing gratitude practice, to raise up the interconnectivity and abundance that undergird our daily lives even when our days are filled with challenge and loss. Jewish time is structured to end each week with Shabbat—literally, a ceasing of activity—that can help us to step out of the demands and preoccupations of the week and support us in refreshing both our bodies and our souls. And of course, the cycle of the Jewish year builds toward the Yamim Nora’im, the High Holidays, when we at once reset the clocks on the year and, through the practice of teshuvah, repentance, reset the moral compass of our lives. Hashivenu means “return us.” The “us” is the Jewish people, asking to be renewed. After the reading is complete, we return the Torah to the ark where it is stored, and we sing melodies, sometimes quite modern, to ancient text. The last line of this part of the liturgy says hashivenu adonay elekha venashuvah: “Help us turn to You, and we shall return.” Hadesh yamenu kekedem: “Renew our lives as in days of old.” This verse is a powerful demonstration of the resilience encoded into Jewish life. Over the past months, I’ve spoken to colleagues and friends like Rabbi Jacob Staub and Rabbi Shefa Gold to talk about the many ways engaging in Jewish practice might bring us renewal. We’ve talking about observing Shabbat, in ways both traditional and unconventional. We’ve explored how humor is an essential component of resilience, and what this means for Jews and Jewish living. We’ve meditated on how chanting lines from the liturgy can open us to new outlooks. The conversations are only beginning, and I hope you will join me in them. As I continue my learning and my search for renewal, it is my hope that listeners find sources of strength for the personal and collective challenges ahead. 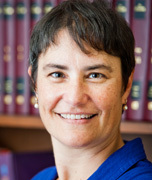 Rabbi Deborah Waxman, Ph.D., is president of the Reconstructionist Rabbinical College & Jewish Reconstructionist Communities. If you have comments about the podcast or questions you’d like me to explore, email me at rrcpresident@rrc.edu. This piece originally appeared at ejewishphilanthropy.com. *Please click the word Hashivenu above to be redirected to the Hashivenu website and podcast episode 1.